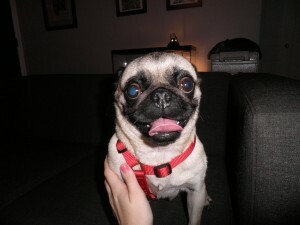 Sonya is a 2 year old female, fawn pug looking for her furever home. We hope to have an update soon from the foster home! We changed her name to Milo and she has done an excellent job responding! She’s adjusting to her new home and has a lot of energy and loves to snuggle. She had a bit of difficulty not being allowed to sleep on my bed at night, but she does sleep in my room with me in her crate which she has no problems walking into voluntarily. She does have a bit of separation anxiety whenever I leave for work but she is doing better with this as well. The final thing we are working on is how she interacts with my roommate’s dog Brady. Brady is a 25-30lb beagle/lab mix a rather small dog but he is still learning when Milo does or does not want to play. Because Milo gets very excited, Brady gets riled up and starts to chase her a bit.